← Do You Know what That New Painted Bicycle Sharrow Symbols on the Roads Mean? The small town of Davis California is a quaint college town where UC Davis is located. For decades bicycles have been one of the primary ways students on a tight budget have gotten around town. So historically bicycles have played a major role in the transportation infrastructure of this city. I used to visit Davis frequently in the 1970s to visit student friends. Davis was the first city in the US to have painted bicycle lanes in 1965. They have been very progressive in building up a wealth of bicycle infrastructures such as protected bicycle lanes. Well they have done it again and just installed the first Dutch Junction Protected Intersection in this country. This protects cyclists from the infamous right hook whereby cars making right terns hit cyclists on their blind spot to their right. I have encountered such close calls while cycling. It also adds protection to pedestrian crossing the street from vehicles making right turns. The YouTube video below gives some background. Northern European cities have been committed for 3 decades to reducing the number of cars on their street by replacing them with bicycles due to the high cost of gasoline. They have spent much time in devising innovative solutions to making bicycling safe, convenient, and attractive. Bicycle infrastructure is quite cheap to build and last for decades before being upgraded with new innovations. 50% of Copenhagen residents ride bicycle to work and shop. It is not uncommon to find citizens who don’t own a car. There are efficient transit systems to take people further but they have few buses due because they use bicycles to get around locally. So you never have to drive. The Dutch Protected Junction Intersection is one of their best innovation. I have posted this and many other designs at Best Practices in Bicycle Lane Designs. The key feature of the Dutch Junction design is the four quarter moon white curved curbs at each corner of the interaction (see figure above) that prevents a car from hitting the cyclist while making a right turn. The green defines the bicycle lanes and the white stripes the pedestrian crosswalks. This curb protrudes far enough out into the intersection with a large radius curve so that cars making a right can have a clear view of pedestrians and cyclists crossing the intersection. The sidewalks also follows the inner curvature of the junction curbs to allow bicycles to easily follow the bicycle lane. These Dutch Junctions are commonly located at busy intersections and frequently have signal lights or stop signs. The photo above is one such Dutch Junction intersection with signal lights in Davis. You can see the quarter moon curb to the right of the cyclist that defines the corner of the intersection and protects cyclists from impact by cars making right turns. The photo above is another view of the same intersection showing vehicle making a right turn. Note that the intersection curves gradually allowing vehicles making a right turn enough time to see bicycles and pedestrians crossing the street. Also note that the pedestrian crossings are handicapped accessible and provide a clear view for motorists making right turns to see wheel chairs. This design clearly gives roads equally SAFE access to bicycles, pedestrians, and the handicapped where they are most vulnerable to car accidents. The right turn is the most dangerous location for cyclists to be struck by cars due to the lack of visibility and physical barriers. 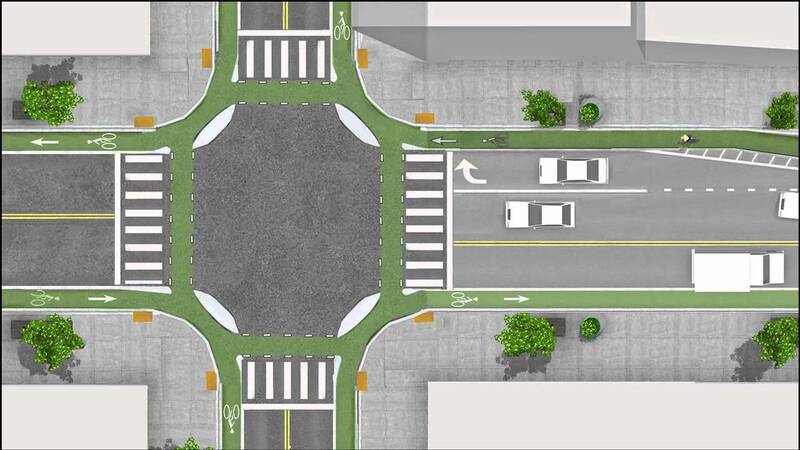 The following link is an interesting discussion on: Four U.S. cities are racing to open the country’s first protected intersection. Vox Transportation has an interesting article about this: Study: protected bike lanes really do increase biking. They have a couple of other good articles: Fewer than 4% of Americans walk or bike to work. Here’s how to change that and This California city just built the country’s first protected intersection for bikes. This entry was posted in Considerations and tagged bicycle infrastructures, blind spot, cars making right terns, Davis California, Dutch Junction Protected Intersection, transportation infrastructure. Bookmark the permalink.